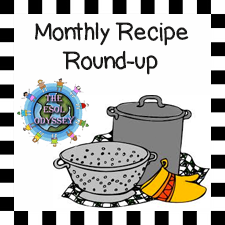 The ESOL Odyssey: February Recipe Round-up: Valentine Dessert Recipes! 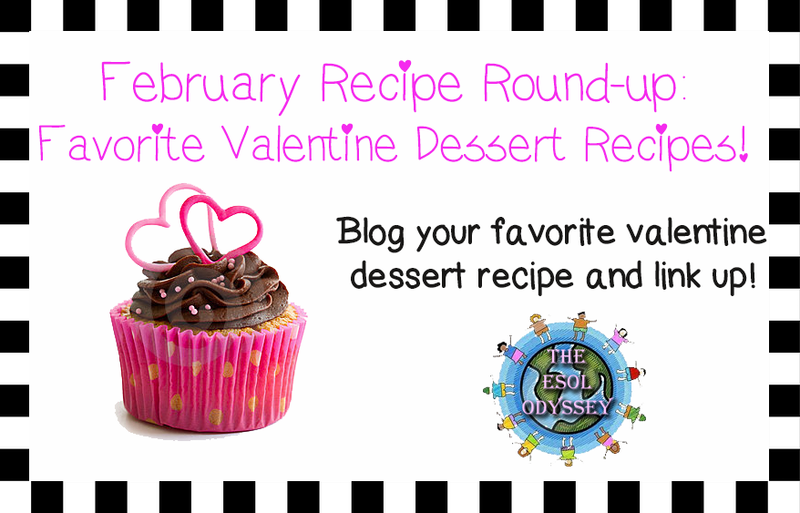 February Recipe Round-up: Valentine Dessert Recipes! Wow, can you believe February has already rolled around? Seems like just yesterday we were putting away the winter decorations. Well, February is the month when we enjoy the day of love, and what's love without dessert? So, I thought this month, it would be fun to share our favorite Valentine Dessert recipes! Preheat oven to 325°F. Grease cookie sheet and set aside. In a large bowl, combine flour and sugar. Mix well. Add in butter and mix until mixture resembles fine crumbs. Knead dough until smooth, about 6-10 times. Pat out flat and pierce with a fork across the top. Using large cookie cutter, cut out as many whole hearts as you can. Leave half of your hearts whole. 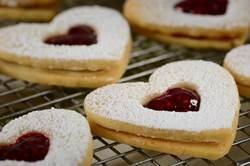 Use the smaller heart cookie cutter to make small cut-outs in the center of the other half. Place on greased cookie sheet and cook for 20 minutes or until lightly browned. Spread 1 tsp. of raspberry jam/preserves on each whole cookie. Place a cut out cookie on top, sandwiching the jam between the two. Use a spoon to add a little more jam in the cut-out. Sprinkle with powdered sugar (or drizzle with chocolate) and enjoy! Hope you enjoy this recipe! Come link up and share yours with us! So now for the "round-up" part! 1. Blog your favorite Valentine Dessert recipe. 2. Add the picture above and the badge below to your post, both linking back here. 3. Add your post to the link-up. 4. Show some love to the two bloggers above you!